The seat heaters and ventilators heat the seats and maintain good airflow by blowing air from the seats. Press the knob to release it. Press the knob back in when finished adjusting the temperature or the seat air flow. The further you turn the knob counterclockwise, the stronger the airflow becomes. The further you turn the knob clockwise, the warmer the seat becomes. To turn on the seat heater, press “HI” or “LO”. To turn off, press “OFF”. 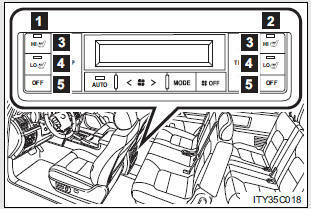 The indicator light on “HI” or “LO” switch indicates that the seat heater is on. Filters are installed in the seat ventilators. For replacement of the filters, contact your Toyota dealer. 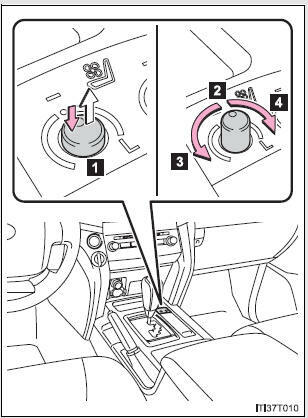 Turn the seat heaters and ventilators off and observe that the indicator light is off when the engine is not running.